Skoda India is gearing up to its much-awaited Rapid sedan on 16th of November, which will be available in three trim levels; these include Skoda Rapid Active, Skoda Rapid Elegance and Skoda Rapid Ambition. The Rapid is an affordably priced sedan and is also priced competitively under the Volkswagen Vento price for its base trim level starts at Rs. 6.99 lakhs and Volkswagen Vento sedan at approximately Rs. 6.5 lakhs for base variant. With availability of diesel and petrol engines and affordable price, the Rapid is expected to provide stiff competition against Fiat Linea, Ford Fiesta, Nissan Sunny, Hyundai Verna, Volkswagen Vento and Honda City in C category saloons. The base Active trim level comes equipped with plenty of attractive features such as 14 inch steel wheels, engine immobilizer for additional safety, rear and front power windows, front center armrest for additional comfort, telescopic and tilt power steering, height adjustable front seat belts for passenger safety and rear windscreen defogger. The mid trim level of Rapid, the Ambition gets all the equipments and features of Active variant plus safety measures, central locking system, antilock braking system, rear and front foglamps and driver airbags. Skoda India has also added plenty of high end features for passenger comfort such as rear armrest, height adjustable driver seat and rear reading light. Also standard are body colored door handles and rearview side mirrors. The high performance Elegance trim level adds 15 inch alloy wheels along with plethora of entertainment and comfort features such as onboard computer, electronically adjustable outside rearview mirrors, CD-MP3 player with rear and front speakers, dual front airbags and automatically controlled climate system for balanced regulation of in-car temperature. 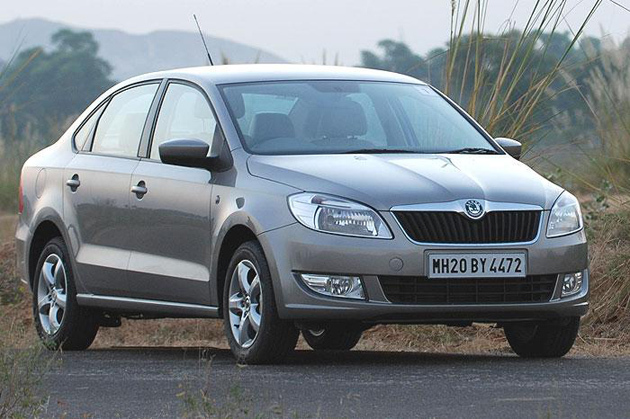 The key modifications to Skoda Rapid include new bonnet, mildly altered chin and new fenders. The cabin inside is similar to that of Volkswagen counterpart apart from its stereo system, Skoda family steering column, gearlever and instrument panel. The stereo system with huge knobs and buttons is clearly Skoda, while buttons, climate control and vents come from Volkswagen. Its 1.6 liter engine generates 105 horsepower with 25.5kgm of torque. Now all the Rapid needs to be a success is the competitive price tag.